Once the sauce is ready, all that’s left to do is shred your vegetables and toss! We went with carrots and a mix of red and green cabbage. But you could also sub other veggies you have on hand, like bell pepper, green onion, or even kale. This would make the perfect side to BBQ-friendly dishes like our BBQ Black Bean Burgers, BBQ Baked Beans, Vegan ‘Pulled Pork’ Sandwich, and Grilled Veggie Skewers! 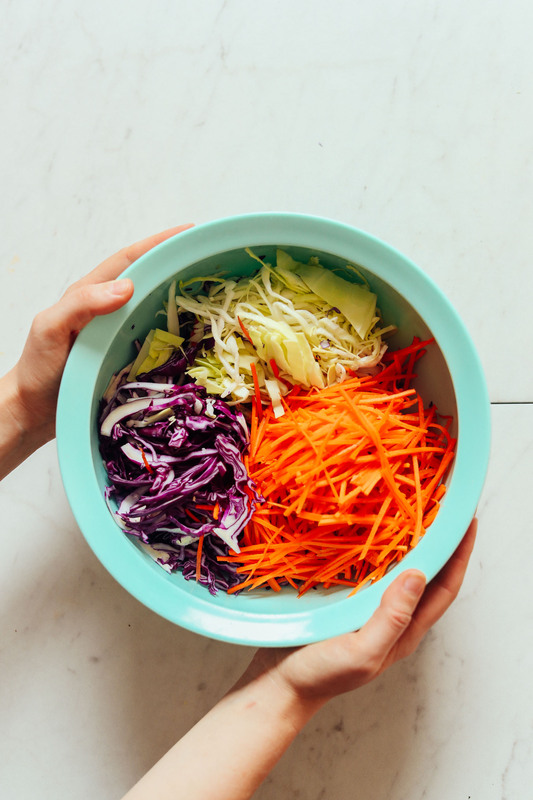 If you’re into this salad, also be sure to check out our Super Cleansing Slaw, Brussels Sprout Slaw with Coconut Bacon, and Simple Fall Slaw! 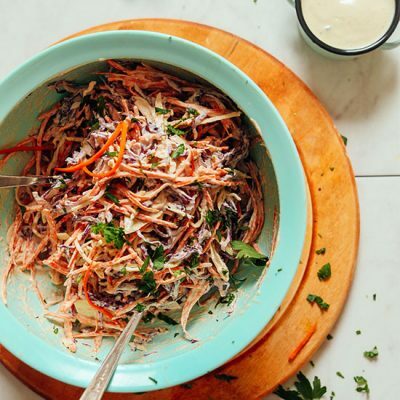 A vegan take on classic coleslaw salad made with 10 simple ingredients! Easy, crunchy, fresh, tangy, and the perfect side for BBQs, sandwiches, and more! Soak cashews. Then drain thoroughly and add to a high-speed blender along with water, maple syrup, mustard, white vinegar, apple cider vinegar, onion, and celery salt (or seeds). Blend on high until creamy and smooth, scraping down sides as needed. If too thick, add more water to thin. If too thin, you can compensate by adding more (raw) cashews (they don't need to be soaked). 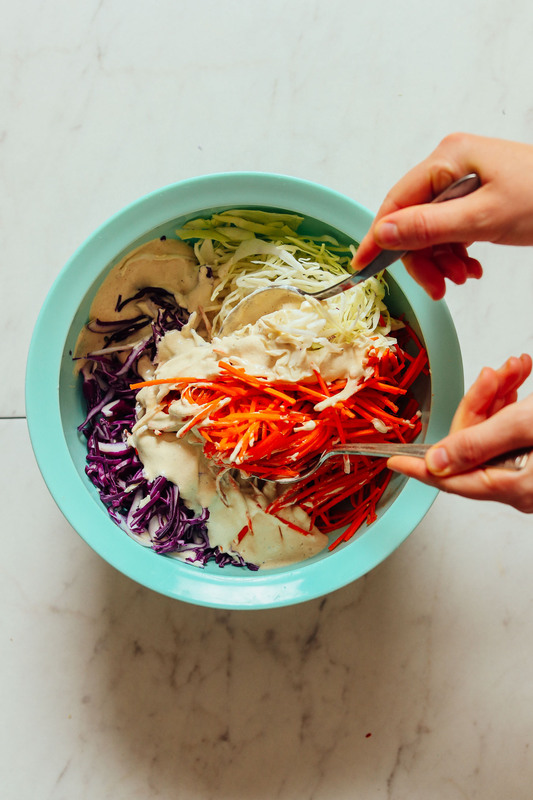 Add carrot and cabbage to a mixing bowl and top with dressing. Toss to combine. Enjoy immediately or store covered in the refrigerator to chill - about 4 hours. Store leftovers covered in the refrigerator up to 4-5 days. Not freezer friendly. Perfect for pairing with things like Vegan Pulled Pork Sandwiches, Vegan Baked BBQ Beans, and Chickpea Sunflower Sandwich! *For a nut-free option, you can sub 1 cup store-bought or our vegan mayonnaise per 1 cup cashews. Adjust other flavors to taste (you may need less vinegar and sweetener). *Adapted from Barefeet in the Kitchen. Absolutely love this recipe!! I love using cashews as a substitute and thought “yes” I have to try it this way. I added sunflower seeds, broccoli and craisins. Amazing!!!! And I don’t even like coleslaw. Love the tang in the dressing. 10/10! I could *not* find celery seeds in the supermarket, and the celery salt available is not only 27% celery seed but a whole host of other additives (not Whole30 friendly), so I used fresh dill (dill seed was recommended as a substitute, but that’s even less likely than celery seed! And I didn’t have any fresh celery leaves, but I did dill). Also, I omitted the sweetener (Whole30 again), and added more ACV after initial taste. Turned out great! Love, love, LOVE that I now have a dairy and oil free alternative to mayo! I imagine I’ll tweak a bit more next time (maybe more mustard?) but this version so far is delicious! This is the first vegan coleslaw recipe I have made and it was great. I don’t need to look any further – it’s a keeper! Thanks! 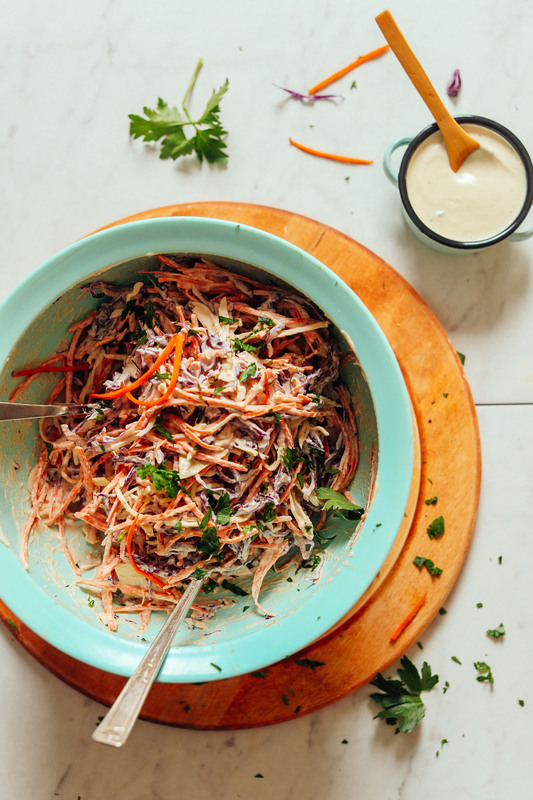 This is the best coleslaw and dressing recipe ever! Crunchy, tangy and healthy. Quick and easy. I have made the dressing with cashews and with sunflower seeds. Subbed the white vinegar with lemon and lime juice – mixed together and separately. I just love it and so does everyone I have shared it with. This is now my go to dressing recipe. You are the best Dana! Another winner! I subbed vegan mayo for the cashews and it came out great!! I love the flavor the mustard gave. Delicious!! Wondering what type of grater (mandoline?) you use to create such light and thin shreds of cabbage? 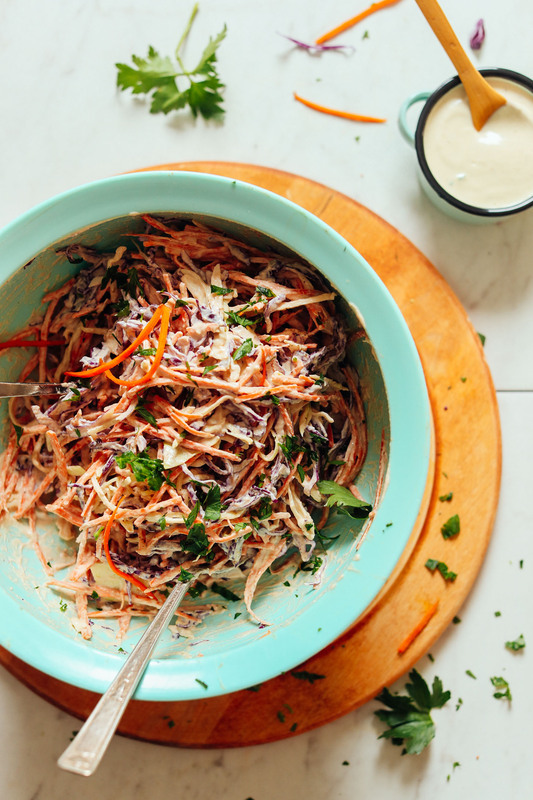 When I’ve tasted slaw made this way by others, makes such a difference in the taste & texture. could you use cashew flour for this recipe? Hmm, not sure! Let us know if you try it out. I can’t wait to make this! I have everything but the celery seed/celery salt at home…can I use something else? Maybe just chopped celery? Is this something that can be left out? You can use celery! And then just add more salt to taste as needed. Which tool do you use to shred your carrots? We used a mandolin, but a grater attachment on a food processor would also work. Just made this to use up some cabbage and it was so easy and so good! I was trying to put it away but pretty much just kept shoveling it into my face. (Luckily I doubled the recipe.) This recipe, like so many of your others, will definitely be a keeper. OMG Dana! you have outdone yourself on this one! I substituted dill weed for celery salt to lower the sodium content but it was still just so amazing. I’m going to use it on tacos tonight but then tomorrow I am going to try it with your beans and gluten-free corn bread. Yum Yum Yum Yum Yum! Oh, how yummy! 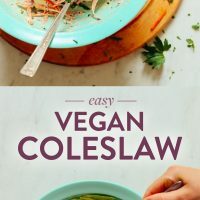 I am normally NOT a coleslaw person, but I can imagine how deliciously creamy and flavorful the dressing is! It’s been a while since I have had a coleslaw-like salad. It’s likely that working with cashews would be challenging for me, but I’m willing to give it a shot! We hope you love it, Cassie! If you give it a try, report back! Thank you for another fabulous recipe Dana! I love coleslaw, and I think this is my new favourite! I used 1/2 cup of a vegan garlic mayo instead of the cashews, because I didn’t have enough, and added sliced pickles and some fresh mint I had to use up – yum! Oh my gosh Dana! Thank you so much for such a fabulous recipe. I think it is my new favourite coleslaw recipe. I used a vegan garlic mayo in place of the cashews as I didn’t have enough and it worked so well. Easy, and went over well at the gathering I took it too. On a veggie brat? Um, yes, please. Ended up adding more salt and apple cider vinegar to boost the acidity. I keep waiting for you to post a recipe that disappoints, but based on your track record so far, it seems I’ll be waiting a while longer. hi. This was delicious! Super easy to make. Perfect for summer dining. Thanks for all your great recipes! This is amazing!! I needed to take a few short cuts so I used bagged shredded cabbage and 1/2 tsp of onion powder (instead of the minced onion). It turned out great. I like my coleslaw to be a bit wetter. I might try for that next time. But honestly, I am over the moon with how it turned out today. I did have trouble making the dressing in my blendtec. There just was not enough to blend well. i ended up moving it to my small food processor and that worked like a charm. Love you and your blog! vegan power forever. I think that would work! Let us know how it goes! Can I use all cider vinegar? Don’t have white. I used all cider vinegar and it tasted fine. Seriously, it looks delish. Look forward to trying it out. But only 3 of those ingredients require chopping. It’s a very simple recipe. Definitely going to make this one! We don’t include water or “optional” ingredients toward the final ingredient count, FYI! Made this recipe today. Best coleslaw ever! The dressing is really nice. I’ll use it to substitute mayonnaise in other dishes. Using more cider vinegar instead of white vinegar works too. Will try the vegan pulled pork next. The video shows coconut oil though?? Good catch! It was mislabeled. It is in fact vinegar. Sorry for the confusion! Amending that ASAP. 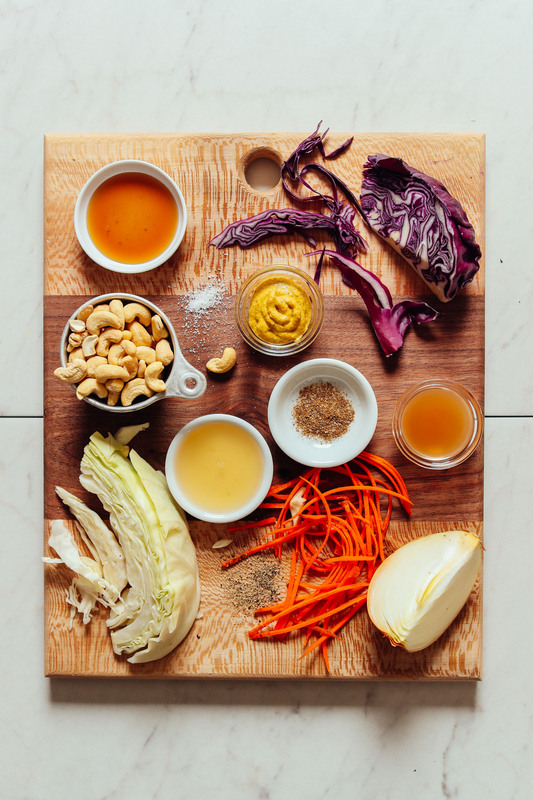 Super excited about that cashew-based dressing!!! This looks fantastic. Ok that does it. Sunday dinner is entirely vegan for the family and all your recipes, because they really are superb. How about the vegan pulled pork, this coke slaw and the vegan baked beans. I’m already looking forward to Sunday !